If you think Multiple Sclerosis (MS) is a rare disease, think again. Over 2.5 million people across the world have MS. Interesting fact here is MS is not as common in Indian subcontinent as in western countries. Multiple Sclerosis affects the nervous system. This unpredictable disease upsets communication between various organs and the brain. Effects of this break in communication can be mild or destructive. Plaque deposits on nerve tissues, caused by MS, leads to destruction of the protecting covering of nerve cells – myelin. Symptoms of MS could be fatigue, dizziness, blurred vision, break down in motor skills, inability to speak, walk or write, pain, tremors, mood disturbances, memory loss, loss of bladder control or heat sensitivity. Causes of MS are not known although it is theorized that it could be due to environmental factors or genetics leading to this autoimmune disease. Hereditary causes, those living in cold northern latitudes for the first part of their lives, those in the ages of 18-45 or immune response genes are some of the risks of developing MS. There is no cure. Treatment could be using drugs, surgery, acupuncture, massage or alternative therapies. There have been numerous studies to test the efficacy of turmeric as an anti-inflammatory, anti-carcinogenic and antioxidant agent. Its neuroprotective abilities are said to provide benefits for Alzheimer’s disease, heal wounds, help in the treatment of various cancers, multiple sclerosis etc. Curcumin is the key active ingredient in turmeric. Initial studies have found that curcumin could block progress of MS. In laboratory tests, mice where bred with illness resembling multiple sclerosis symptoms called EAE – experimental autoimmune encephalomyelitis. EAE also erodes the myelin sheath similar to multiple sclerosis. They were injected with 50-100 micrograms curcumin thrice a week for about a month and showed few signs of the symptoms. Animals not given curcumin developed severe paralysis within 15 days. The mice given 100 micrograms showed the least symptoms of MS throughout the study. It was estimated that the dose given to the mice was the same as that consumed by an Indian in his or her daily diet. This could be the reason why autoimmune diseases are rarely found in countries like India and China where turmeric is widely used in cooking. The way that curcumin works to prevent multiple sclerosis could be by inhibiting manufacture of IL-12 protein, the main cause of damaging the myelin sheath. Feeding the mice with curcumin also dramatically reduced IL-17, IL-6, TGF-beta, IL-21, RORgammat and STAT3 expression. Production of TH 17 cells which causes various inflammatory diseases was inhibited. Breakdown in immune system is the cause for autoimmune diseases like MS. Studies are increasing on using herbs to treat these diseases since they cause few side effects and are inexpensive. Curcumin in turmeric has long been touted as a chemical to combat autoimmune diseases since it can regulate inflammatory cytokines. According to some researchers curcumin could treat the pathophysiological progress of MS since it has neuroprotective and anti-inflammatory properties. MS damages the blood-brain barrier leading to injury of myelin sheaths and axons. Prophylactic treatment using turmeric could prevent this damage and prevent such damage. This could go a long way in preventing symptoms of multiple sclerosis before they appear. 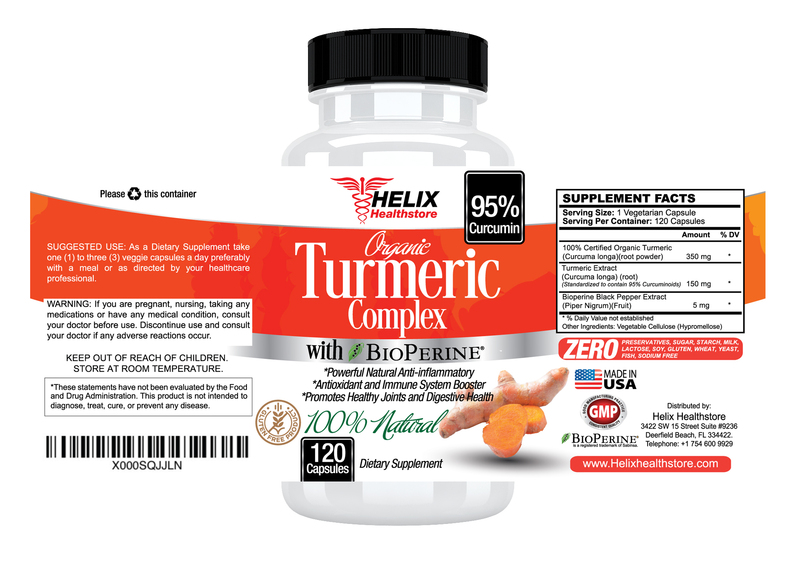 Organic Turmeric Complex (95% Curcumin) with BioPerine® Black Pepper Extract for EXTRA Potency. 120 Vegetarian Capsules - 500mg. Powerful Organic ANTI INFLAMMATORY and ANTIOXIDANT Supplement with All Natural Ingredients and Gluten Free. No additives. Made in USA. INNUMERABLE BENEFITS FOR YOUR HEALTH: Turmeric Curcumin is a Top Natural Herbal Remedy used for Centuries to benefit your health and boost your immune system . Used to combat inflammation and promote healthier skin, liver function, brain and memory function, digestion and provide relief for joint pain.This is a potent supplement that has helped many people return to a normal quality of life. INCREASES ANTIOXIDANT CAPACITY OF YOUR BODY FOR SUSTAINABLE HEALTH: Oxidative Damage Causes Aging And Plays a Detrimental Role in Many Health Conditions. These Organic Turmeric Curcuma Capsules Not Only Lock The Free Radicals, But Also Stimulate The Body’s Own Antioxidant Mechanisms. 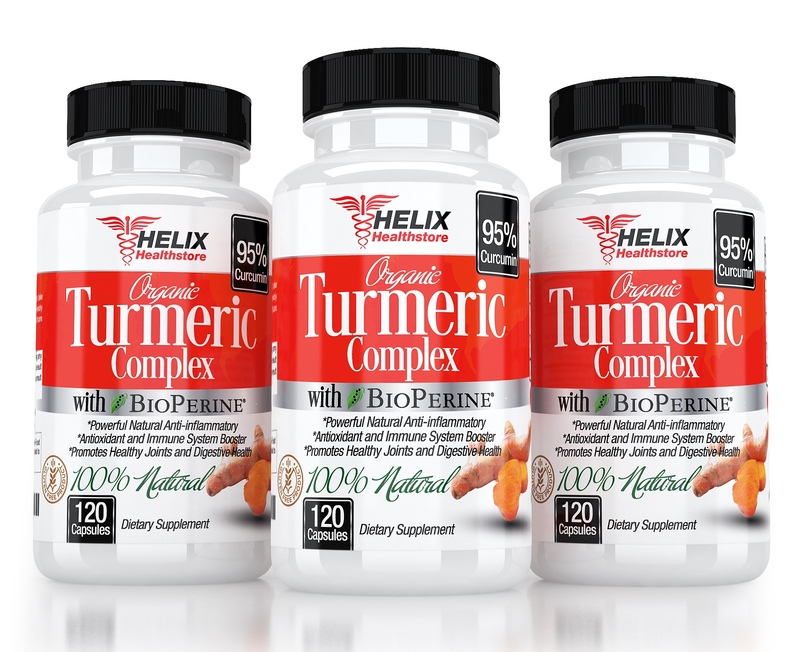 SUPERIOR ABSORPTION: Unlike other Turmeric products, our Organic Turmeric Complex comes with added BioPerine® for enhanced absorption and bio-availabilty. PREMIUM QUALTY INGREDIENTS: Made with the purest 100% Organic Turmeric Curcumin with 95% Curcuminoids and added BioPerine®, the most potent formula available. Our products are made in USA in GMP certified facilities. Contains no binders, fillers, additives or artificial ingredients. 100%Natural and gluten free. If you are suffering from pain and inflammation, one of the leading causes of illnesses in the body, Turmeric pills could be the solution you are looking for. 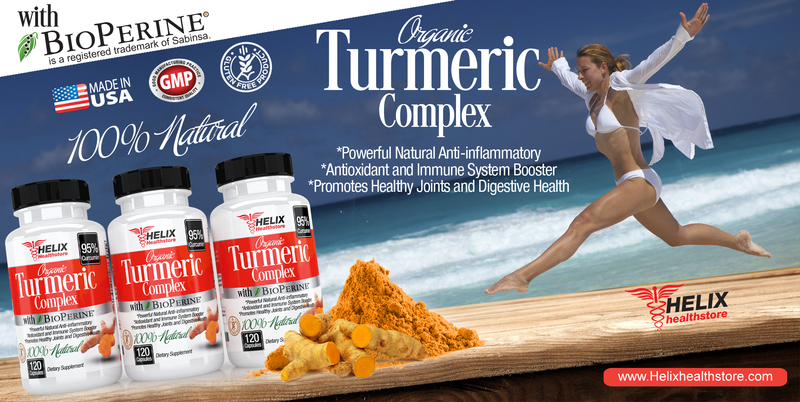 Did you know that Turmeric root is the most potent natural substance known to maintain a healthy inflammation response. It has remarkable healing properties and the health benefits are amazing. UseTurmeric on a daily basis to reap the enormous benefits of this wonderful natural spice.